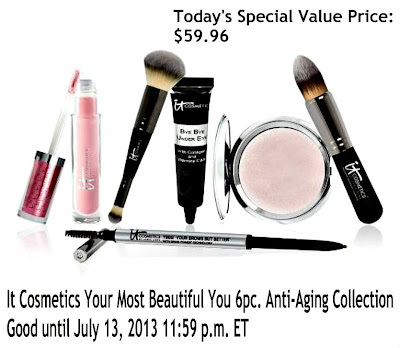 It Cosmetics has another fantastic kit available on QVC today through midnight! The It Cosmetics Your Most Beautiful You 6pc. Anti-Aging Collection is priced at just $59.96 plus shipping, and includes 2 of their top quality brushes, and 4 color cosmetics. I've been very pleased with the It Cosmetics line, and I am loving the products in this kit. Their brushes are among my favorites to reach for, and after falling hard for their Vitality Flush Color Stain Stick months ago, I was excited to see their Vitality Lip Blush Hydrating Lipgloss Stain offered in this newest kit. Check it out! What is it: A six-piece anti-aging collection that truly gives you the power to be Your Most Beautiful You! Who is it for: Anyone who wants to instantly conceal imperfections, diffuse the look of lines and wrinkles on their face, blur away pores from view, and achieve a more radiant looking, flawless complexion. Why is it different: Developed with leading plastic surgeons, these popular products and new items combine to give you the power to look and feel your most beautiful! Bye Bye Under Eye antiaging, full-coverage treatment concealer--which can also be used as a foundation--delivers highly pigmented coverage that won't crease or crack and is designed to make your skin appear younger at the same time. Our beloved Your Brows But Better pencil covers gray, looks natural, and is packed with antiaging ingredients utilizing cutting-edge brow-enhancing technology! Our Hello Light antiaging luminizer cream gives your skin a healthy-looking lit-from-within glow. And finally our brand-new long-lasting Vitality Lip Blush Hydrating Lipgloss Stain is infused with oils and butters for the most luxurious pillowy feeling on lips, without stickiness or thickness.